Recently, Drs. Zvi Bodie and Rachelle Taqqu wrote an article in the Wall Street Journal calling on investors to avoid stock market risks. In one example of a way to limit risk, they describe a method using stock options to create a “collar” to limit stock losses. I decided to back-test this idea to see how it would affect investor returns. In Bodie and Taqqu’s example, they assume an investment in the exchange-traded fund SPY which tracks the S&P 500 (stocks of the biggest companies in the U.S.). At the time of their writing, a share of SPY was trading at $136.41. You could buy a put option at $116 to limit losses to about 15% over 4 months. To avoid being out the cost of this put option, you could also sell a call option at $143. These strike prices were chosen so that the call and put had the same cost and you weren’t out any cash. The result is that if you use this collar, over the next 4 months you can’t lose more than 15% on your SPY investment and can’t make more than 4.8%. If these caps on your upside and downside seem a little unbalanced to you, I agree. 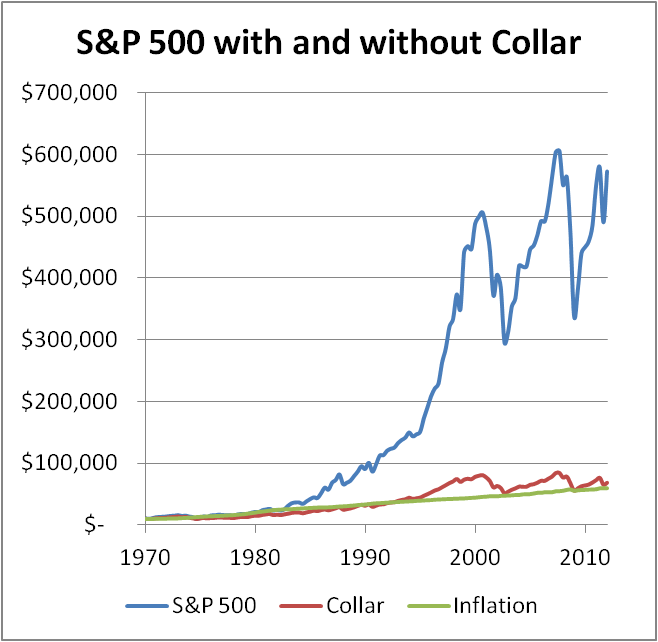 I decided to dig up some historical S&P 500 stock returns and see what a collar like this would do to returns. In a first experiment, I used 42 years of S&P 500 data starting in 1970. I ran one portfolio without a collar and another with a collar from -15% to +4.8% on the capital appreciation (or depreciation) every 4 months. Both portfolios received dividends. The results for the collar were dismal. Without the collar you end up with $572,000, and with the collar you end up with only $14,400. That’s nearly 40 times less money! However, this is likely not a fair test because in times of higher inflation the collar was likely shifted a little toward positive returns. In another experiment, I assumed that the collar shifted up when inflation was higher. Essentially, this places the collar at a fixed position in real terms (after inflation). 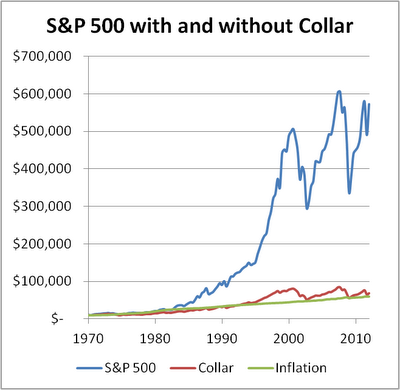 The following chart shows the growth of $10,000 with and without this collar. The results for the collar are still dismal. Instead of $572,000, you end up with only $67,800. This is a huge price to pay for the comfort of limiting your downside to 15% every 4 months. The collared portfolio only beat inflation by an average of 0.3% per year. In contrast, the S&P 500 beat inflation by an average of 5.5% per year. The collar that Bodie and Taqqu propose may sound like a good way to protect your portfolio, but you’ll pay a very high price for it over the long run. Nice analysis. There will always be people who think they can capture stock market upside while protecting themselves from loss, but as you've shown, this not possible. The best way to limit losses in your portfolio is to add an appropriate level of high-quality fixed income. Doesn't sounds as clever, though. @Dan: Thanks. There does seem to be a premium on clever-sounding answers. One trouble I've noticed with adding fixed income is that some investors just focus in the losses on their stocks instead of focusing on the entire portfolio. I guess you can't save everyone. Nice way to show the real effects... I'm sure option prices vary quite a bit so the collar you can get this month might not be the same one you could get 20 years ago. Option traders seem generally smart enough not to misprice options on a rising market though. And our natural fear of loss might even bid up the price of put options consistently. A follow-up article they wrote tells all. A reader asked what size of portfolio would be needed to produce income with another of their recommendations, and they replied "take the annual income you want and multiply by the number of years you want it for". This is not an investment strategy. @Simply Rich Life: I agree that it's hard to say what percentages the collar would have had in the past without actual data. However, I think I made a fair guess. It's true that "take the annual income you want and multiply by the number of years you want it for" is not really an investment strategy, but it is likely an honest assessment of what you would have to do if you followed their advice. If your real return is zero, then you're just dividing your money across the number of years of retirement.